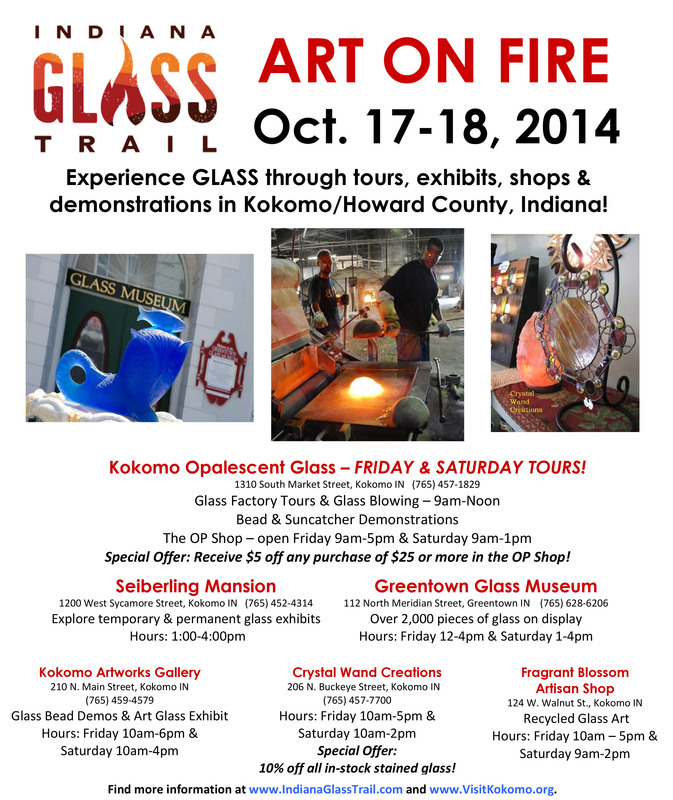 Learn about Kokomo/Howard County’s rich glass heritage during “Art on Fire” on October 17-18, 2014. Experience amazing art glass through factory tours, glass blowing demonstrations, exhibits, and shops during this special glass weekend! Go behind the scenes at Kokomo Opalescent Glass, America’s oldest art glass company, on a fascinating tour to experience the glass-making process. Watch as hot glass is ladled from a 12-pot furnace, hand-mixed, cooled, and shipped all over the world. They produce over 22,000 variations of sheet glass! Also, see local glass blowers create unique glass art in the Hot Glass Studio, watch bead and suncatcher demonstrations, and have the opportunity to purchase beautiful glass items made by local artists in The OP Shop. Glass production tours and glass blowing will be offered from 9:00 a.m. through Noon both days. The OP Shop will be open on October 17 from 9 a.m. – 5 p.m. and October 18 from 9 a.m. – 1 p.m. Special Offer: Receive $5 off any purchase of $25 or more in The OP Shop! Explore the Howard County Museum, located in the remarkable Seiberling Mansion, built by industrialist Monroe Seiberling for his family in 1891. The Mansion contains beautiful stained glass windows created with art glass from Kokomo Opalescent Glass. Some of the windows are original to the house, others were added during a recent renovation. The museum possesses one of the largest known collections of Jenkins Glass, produced in Kokomo, and has a portion of it on permanent display. There is a temporary display in the James Long Gallery, featuring Kokomo Opalescent Glass. Visitors can also see representative pieces of Greentown glass, produced by the Indiana Tumbler and Goblet Company in Greentown, and Bournique glass, which began in Howard County. The Seiberling Mansion will be opened from 1-4 p.m. on October 17 and 18. Next, head to Downtown Kokomo to discover Artworks Gallery, Crystal Wand Creations, and Fragrant Blossom Artisan Shop! Artworks Gallery will feature glass bead demonstrations and an art glass exhibit during this event. Talk with local artists while they work and see beautiful artwork in a variety of mediums in this 2-story art gallery. By the way, all pieces of art in the gallery are also available to purchase. Artworks Gallery will be open October 17 from 10 a.m. – 6 p.m. and October 18 from 10 a.m. – 4 p.m.
Find local, handmade glass items at Crystal Wand Creations, including glass jewelry, stained glass ornamentals, panels, suncatchers & wind chimes in this unique retail shop located in Downtown. Special Offer: Receive 10% off all in-stock stained glass! The shop will be open October 17 from 10 a.m. – 5 p.m. and October 18 from 10 a.m. – 2 p.m. Purchase beautiful, custom glass art platters made from wine bottles at Fragrant Blossom Artisan Shop. The shop also carries handmade soap, candles, and accessories from Indiana artists. Open October 17 from 10 a.m. – 5 p.m. and October 18 from 9 a.m. – 2 p.m. Make sure to visit all three shops while in Downtown! Finally, don’t miss a visit to the Greentown Glass Museum. The museum’s permanent exhibit houses over 2,000 pieces of glass on display, including a vast number of pieces of glassware produced by the Indiana Tumbler and Goblet Company in Greentown between 1894-1903. The extensive display features various glass patterns and highly collectible pieces, such as Chocolate Glass, Golden Agate and Rose Agate. 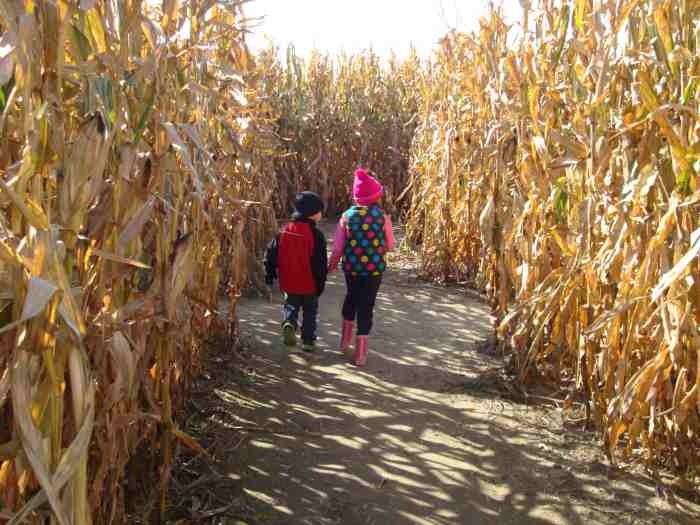 Open October 17 from 12-4 p.m. and October 18 from 1-4 p.m.
To plan a visit, call 800-837-0971 or go to www.VisitKokomo.org. For more information on where to see glass in Indiana, go to www.IndianaGlassTrail.com.